M. K. Raghavendra is a film critic, scholar and researcher. His other books include Familiar: Narration and Meaning in Indian Popular Cinema, 50 Indian Film Classics, and Bipolar Identity: Region, Nation and the Kannada Language Film. Raghavendra was awarded the 1997 National Award for Best Film Critic. His articles and essays have been published across the globe. He is also the founding editor of a web journal by the name of Phalanx, which is an online platform for debate. He is also the founding editor of a film journal titled Deep Focus. The author enjoys French cinema, and is fond of David Cronenberg. Familiar: Narration and Meaning in Indian Popular Cinema was listed as one of the best books on cinema by India Today. 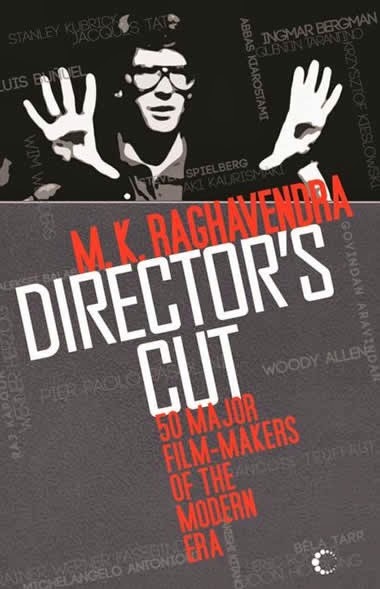 This book, along with Raghavendra’s 50 Indian Film Classics, was declared by Fédération Internationale de la Presse Cinématographique as two of the world’s best books on movies. Director's Cut: 50 Major Film-makers Of The Modern Era, published in 2013, is an analysis of the fifty best filmmakers in the last few decades. This book brings together essays that focus on a wide range of work by these directors. Since the 1950s, cinema has taken a completely new look. Though the changes in filmmaking have been radical, cinema criticism has not quite evolved over time. This book has been written to fill that gap. It analyses renowned filmmakers starting from the 1960s. Director's Cut: 50 Major Film-makers Of The Modern Era discusses the work of the Mexican director, Luis Buñuel. Readers will also come across an essay about the Russian Andrei Tarkovsky. Further, this book concentrates on the French director Robert Bresson, who was known for his aesthetic and spiritual style of work. Those who are keen to know about the French New Wave movement will find this book very valuable. The author has also covered the famous Hungarian filmmaker Béla Tarr, as well as the internationally acclaimed Iranian director Abbas Kiarostami. An essay on the famous and popular Steven Spielberg has also been included in this guide. Five Indian directors are also a part of this book. Some of them are Adoor Gopalakrishnan, G. Aravindan, Satyajit Ray, Raj Kapoor, and Ritwik Ghatak. The essays that make up Director's Cut: 50 Major Film-makers Of The Modern Era have been very well written. The book is sure to keep readers engaged with its coverage of numerous different directors from all across the globe. Director’s Cut is an easy lucid and simple to understand book. It gives precise and consise information say in 6-7 pages, about the life of 50 greatest film makes of all the time. I loved and enjoyed reading about Raj Kapoor, Woody Allen, Ritwik Ghatak, Quentin Tarantino and Steven Spielberg. Lastly, would like to conclude that the Director's Cut make a brilliant, informative, and entertaining read.